going to have to pour out of me to mend these garments! I suppose look forward to a few posts dedicated to my new finds. on finding those old summer clothes. gorgeous dress, I can't wait to see more! i can hardly see your shoes but already like them! I agree with Tink; it looks modern and up-to-date now. The collar is very interesting, too. You look lovely! Love ur shoes! such a good girl look! beautiful dress! can't wait to see the rest! Approvingly your article helped me truly much in my college assignment. Hats afar to you dispatch, wish look forward for the duration of more interrelated articles promptly as its sole of my favourite topic to read. That dress is adorable, I love those balloon sleeves and the collar reminds me of a sailor! Lovee that dress! Perfect with the tights! The dress is pretty and lovely at this length, you're a mighty fine seamstress! love the dress, goes well together with the tights!! Very pretty dress! You did a good job hemming it. Predilection casinos? ruminate on this advanced [url=http://www.realcazinoz.com]casino[/url] operation and transform to up online casino games like slots, blackjack, roulette, baccarat and more at www.realcazinoz.com . you can also search into our blooming [url=http://freecasinogames2010.webs.com]casino[/url] orientate at http://freecasinogames2010.webs.com and provisions proficiently in licit substitute ! another late-model [url=http://www.ttittancasino.com]casino spiele[/url] get one's hands is www.ttittancasino.com , during german gamblers, pressurize freed online casino bonus. AH! I think I've told you this before, but I seriously die a little every time I visit your blog, it's definitely one of my favs! You did a great job with the hemming! I love how it's uneven. The collar totally magnifies that dress ! I love the handbag! It's perfectly lovely with this dress. i have many things to fix up but i have been rather lasy lately. This dress is so..Alexa Chung ! i love the collar on this dress! i am soo terrified of hemming/altering my own clothes but i looove going to the tailor! thats a pretty dress. .i lvoe the neckline .. i think its "springy" i know what you mean i have bout several sandals and wedges but it heard for me to shop for the season ahead .. I am head over heels for your dress! This is so gorgeous, you look beautiful! im in love with your dress! OoOooo love the dress ! suits you real nice ! This dress is sooooo cute !! I'm just loving the collar!!!! ps: do you know sth about the GIVEAWAY on my blog??? you can win a copy of the FACEHUNTER BOOK!! this ensemble is simply perfect in EVERY way! Ah I love that dress. I wore a skirt to uni today that I'd thrifted and altered so that like yours, it wasn't ankle length and I got so many nice compliments! I definitely think that thrifted buys are wonderful things. WOW! Nice job, that dress is so adorable now!! 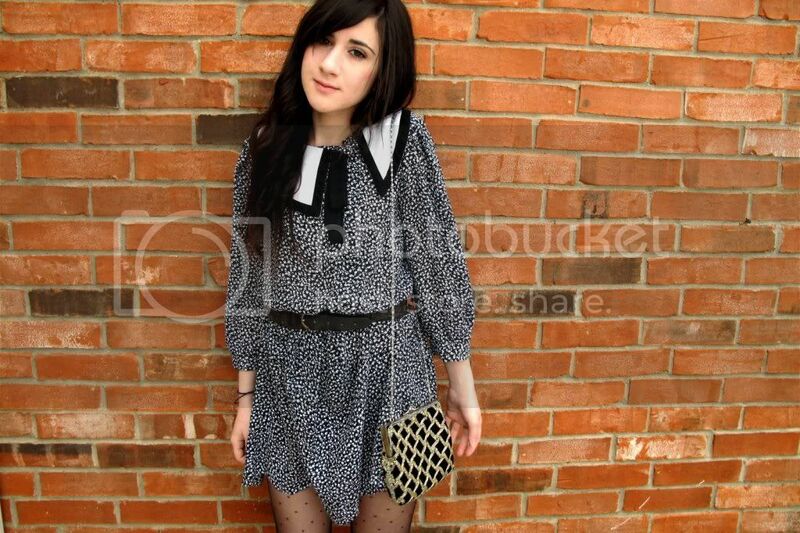 And love the pairing with polka dot tights. And aw! Personally i'm a fan of escaping sweaters and other winter needs! This flippy dress is so fantastic and love the neckline. Your thrifting finds are so inspiring. This dress is really too lovely! And I really love your hair! I love everything about this dress and tights combo. It's sweet and sophisticated at the same time. It also reminds me that it's getting warm enough here to get textured tights and I have about three pairs and they're all black. No good. No good. You're so adorable despite your sophistication. I want to transform you into a doll and take you home Stateside. you look great in that dress and tights! love it. I know what you mean, sometimes it's so hard to look for summer clothes, when you see loads of cool winter clothes..
Oh what a gorgeous dress! Love it so so much<3 The whole outfit is so beautiful! This is such a gorgeous outfit. 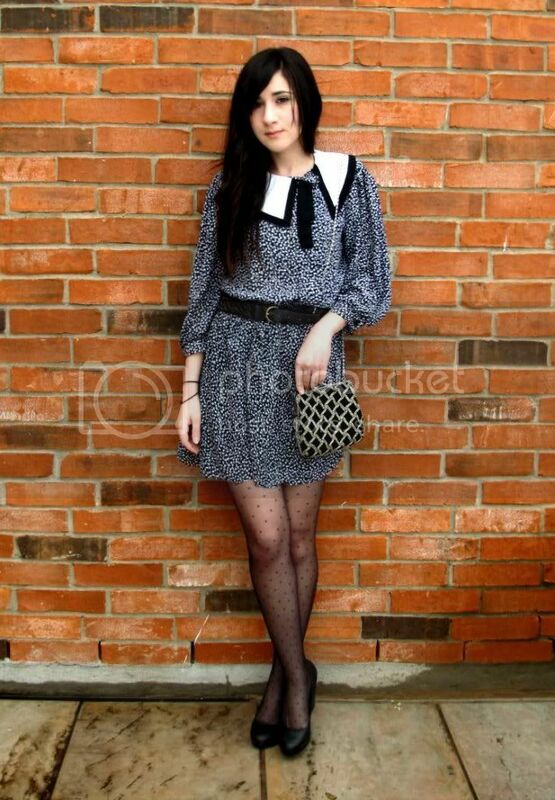 Love the vintage feel to it and the bag with the dress is bold but so girlie :) Love it. You look adorable. I never have luck at thrift stores, but maybe I'm looking for the wrong things. I need more casual dresses anyway. Maybe it's time to give it another shot. You seem to very good at mending. I wish I knew how to hem, or was better at sewing.